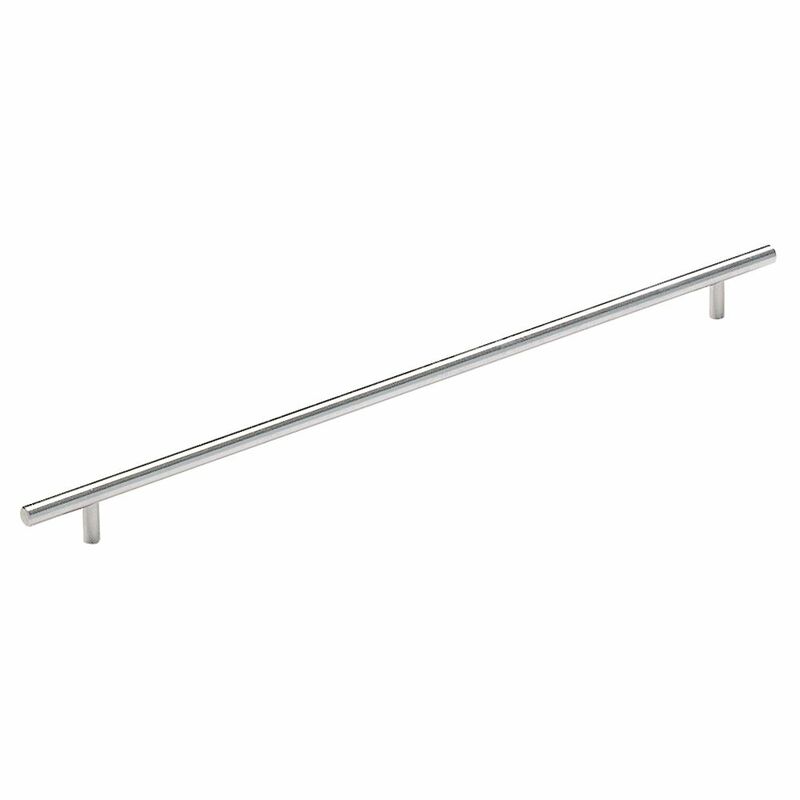 The Amerock BP19015CSG9 Bar Pulls 16-3/8in(416mm) CTC Pull is finished in Sterling Nickel. Modern functionality meets straightforward styling. Simple. Bold. True. The sleek and sophisticated design of the Bar Pulls Collection makes a statement with clean lines and smooth textures. Sterling Nickel is a cool, smooth and metallic silver-toned finish that is timeless and subtle. The Amerock BP55274G10 Blackrock 1-13/16in(46mm) LGTH Pendant is finished in Satin Nickel. The BlackRock collection offers sleek simplicity with a contemporary indulgence. This eclectic line boasts bold shapes and sizes. The classic Satin Nickel finish provides a sleek, lightly brushed, warm grey metallic look. The Amerock BP55276GM Blackrock 3-3/4in(96mm) CTC Pull is finished in Gunmetal. The BlackRock collection offers sleek simplicity with a contemporary indulgence. This eclectic line boasts bold shapes and sizes. Elegant and eye-catching, Gunmetal is the perfect alternative for those who love metallic, but prefer a hint of subtlety. Use this finish to enhance the modern ambience of stainless steel and black appliances without overwhelming their natural gravity. The Amerock BP1590WID Inspirations 3in(76mm) CTC Pull is finished in Wrought Iron Dark. Clean, classic lines in a casual relaxed style, Inspirations is designed to compliment any dicor. Wrought Iron Dark is a tonal finish that combines a dark black colour with subtle hints of gray, giving each design interest and dimension. The Amerock BP55344BBZ Revitalize 3-3/4in(96mm) CTC Pull is finished in Golden Champagne. Function and a revived spirit of renewed traditionalism meet tailored eclecticism in the Revitalize Collection. Golden Champagne: raise a toast to this rich metallic finish. Warm and inviting without being brassy, this attractive hue elevates designs with enviable versatility. Use for a soft and elegant touch on lighter finishes or as a contrasting pop against darker finishes. Bar Pulls 16-3/8 Inch (416mm) CTC Pull - Sterling Nickel The Amerock BP19015CSG9 Bar Pulls 16-3/8in(416mm) CTC Pull is finished in Sterling Nickel. Modern functionality meets straightforward styling. Simple. Bold. True. The sleek and sophisticated design of the Bar Pulls Collection makes a statement with clean lines and smooth textures. Sterling Nickel is a cool, smooth and metallic silver-toned finish that is timeless and subtle. Bar Pulls 16-3/8 Inch (416mm) CTC Pull - Sterling Nickel is rated 5.0 out of 5 by 2. Rated 5 out of 5 by Ciaran from Very nice finish and quality - the size was perfect... Very nice finish and quality - the size was perfect for our application. Will order more from this line.